Well, we've reached the end of the City. Underneath your feet is the remains of the old city gate, St. Georges Gate, that was demolished in 1801. The road ahead, the New Dover Road, leads, as you might expect, out of Canterbury to Dover. The road that passes from left to right here, is the main inner City Ring Road and causes much waste of petrol as people sit and fume in the jams. Turning right here leads into a pleasant walk around the City Walls. 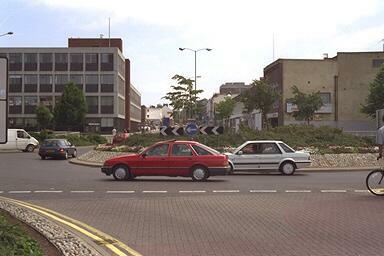 Turning left leads to Burgate and the Cathedral.